Day 4 and sadly the last day of testing out the new running and endurance camp by Trail Ferret. Again we were blessed, as I opened my eyes in the early hours of the morning, well 6am, the sun was streaming in through the windows. I was a little slow at getting up this morning as I had a real tightness in my upper hamstring - I can only put this down to the bravedo of sprinting up the side of the cliff attempting to out run the cliff railway the prior day!!!!! - in hindsight not a clever thing to do, but, on the other hand, someone had to do it! Throughout the last 4 days of trying out Trail Ferret, runners had come and gone, this morning the core 7 were still here and today we were off on the last part of the North Devon Coastal Path system. There was no way any of us were sitting this run out (even though I was hobbling around there was no way I was not completing this day). It was the longest run of the week and Ben (Papa Ferret) explained at breakfast that we were to be dropped off at Lee Bay, by the support minibus and head out north over to Ilfracombe and then continue through to Hunters Inn. Looking at the map this meant that over the 4 days we would have traversed the coastal path from Saunton Sands in the south, up and along north to Watersmeet in the North. A total of 84k with some 3,064M (10,111Ft) of ascent. Pondering over the map I could see that today had some steep killer ascents, so self preservation was the order of the day to make sure I did not damage my hamstring and not complete the run. No racing off today to take photos, it was to be the "ultra shuffle", take it nice and easy and stay at a constant pace. Breakfast came and went and as usual the staff at St George's House could not have been more amenable. From early on in the morning I had tried every trick to ease the hamstring but as we got into the crew bus it was just not easing up, even the devil golf ball just was not doing it - oh well it was going to be a painful day. It was the hottest day of the week, I really don't tire of mentioning that, can't believe how lucky we were with the weather! As we left Lee Bay the tide was out and the cliffs looked stunning. We set out north and after a couple minutes of hill climbing we picked up the coastal path and headed off over to Ilfracombe. The climb out of Lee Bay was easy, but the left hamstring was not having it, so I settled down to an easy pace and enjoyed the scenery out over to Ilfracombe. Ilfracombe was a vibriant seaside town back in the days of Victorian splender, and when I was a kid I have fond memories of holidays with the parents down here too. However, over the years it's seen a decline, but as we came down into Ilfracombe, parts of the town and marina are undergoing a lot of redevelopment and regeneration, so it looks like it could be coming back into fashion, let's hope so. I digress!! My hamstring and connecting muscles was really beginning to niggle as we rocked up into the marina to meet the support bus and have a bit of sight seeing. For a split second I considered stopping, only for a split second mind you!! - Now I said I would never mention this, but Ben went beyond his duties here. The decision was made to strap my hamstring & glute muscle area which meant a trip into the back of the bus for an undignified couple of minutes. Enough said - all I can say is thanks Ben! Coming out of Ilfracombe we headed back up out onto the coastal path for our first real climb. This climb and section of the path is locally known as the "Baby Elephant". The picture to the left shows the cliff formation looking like a baby elephant lying down. The steepest part of the climb was 115M with a gradient of about 20% and once up the reward was a truly majestic view. This next section of the route was taking us along the coastal path down into Hele Bay (A very small but picturesque sleepy bay) and then over to Watermouth where the crew bus would be waiting for us at the marina. This took us about 55mins at an easy pace from Ilfracombe and as we came over the cliffs to Watermouth we started to descend, rather steeply, and had this wonderful view of the marina. The cove offers a very sheltered, secluded harbour, shielded by the natural breakwater of Sexton's Burrows as well as picture-perfect views. This has created an ecosystem for many rare marine species. After a few minutes of topping up the energy drinks we set off towards Combe Martin. The terrain changed here, as the route takes you inland and you have to follow the road for awhile. This section was undulating and was probably the easiest going, which was not a bad thing, as the last section coming up was to be the hardest. Combe Martin is a lovely seaside village and it is here we met up with the crew bus and took 5 minutes out to soak up the golden sunshine. Straight out of Combe Martin the ascents started with vigor, which got the heart pumping. Into a climb of 358M (1,182ft) and back out on top of the coastal path where we were met again with another awesome vista. The taping of the left leg was assisting and I just got into a rhythm and set the pace and off we went along the path for circa 4Km, from where we again moved inland across heather, down into a sheltered valley and then back up towards Trentishoe Hill with another steep climb of about 225M (743ft) - This section was slow going, because, unless you are a fell runner, heather is just soooo slow to run on!!!. Reaching the top was awesome - the video below gives a small taster of the vista back towards Ifracombe in the very far distance. Here we have Ben and Ali coming up the last bit of the trail. After a few minutes of admiring the view, well watching one of the support crew run up to meet us for some photo shots, we set off for the last leg, a nice gentle descent back down into the wooded valley of Hunters Inn. From here the pace really picked up and for the last few Kilometres all jovial banter disappeared and it seemed that a race was on between the 7 of us to get to the finish line - it wasn't really a race but somehow after 4 and a half hours of running, competitiveness got the hold of us and it was a push to the finish line. Recovery shakes over and done with, Ben and the support crew got the lunches and bottles of bubbly out to celebrate the completion of the first Trail Ferret Endurance Training Camp. Everyone was in high spirits (pun not intended) and we spread out into the meadow by the running stream. Again, the stream was a welcome relief and there is something quite pleasant about mucking around in the river with drink in hand and the warmth of the sun on your face. The chill of the drink cancelled out the chill of the stream! This was a perfect way to finish the 4 days of running, ok, I was there to test the training camp out, but, to be really honest it did not need testing out, Ben had it in the bag already!!!!!!! WELL DONE BEN - a lot to be said for thinking about what people want and effort into preplanning. So, if you ever want to get away for a few days trail running with some coaching thrown in look at Trail Ferret. Ben not only makes sure that all your running needs are taken care of, but that you have a good time and everyone's level is taken into account. Ben is a friendly guy, full of enthusiasm, you are made so welcome as soon as you arrive. His priority is always that your health and welfare comes first and to make sure you have a good experience. I can't recommend it enough, and something I would certainly do again. Thank you Ben for the chance to try out Trail Ferret, which I know is going to be awesome! Another glorious morning as I wake up to the sun shinning through the window of my room at St George’s House. I have a great view as I lie there, looking out over the village and it's church while I contemplate the day ahead. I think, actually, I know that day 3 of testing out the endurance training camp - Trail Ferret - is going to be another awesome day out on the North Devon Coastal Path. I've already had 2 glorious days so far and today's trail will take us from Watersmeet, back along the coast to Hunters Inn ( for me this section was probably the most stunning of the 4 days). Up and a nice leisurely relaxed breakfast, with some fun banter as we are all getting to know each other better. As usual the staff at St George's House had it all ready laid out for us, so the only thing to do was to discuss the route and the plan for the day with Ben. The support team (again, a must for the success of this type of running holiday, and Ben had everything planned perfectly and had thought of everything right from day one!!) was going to drop us off at a place called Watersmeet (about a 30 minute trip out) and would meet us again at the Valley of the Rocks in case anything was needed. From looking at the OS map, Watersmeet was a wooded valley and that the start of the day would be a nice easy descent down into Lynmouth . From there we were to head out to the Valley of the Rocks following the coastal path around to Hunters Inn where the support crew would be waiting with Lunch. Sounded another awesome day to me! The 7 of us had now gelled into a great group and the constant nattering and jovial banter in the crew bus was refreshing as we trekked over to Watersmeet. Watersmeet was truly beautiful, a great start to the day meandering through the wooded valley on our way down to Lynton. This took us just under 30 minutes to do and got us warmed up for the next stage of the run, which was from Lynton and up onto the coastal path heading off is a southerly direction. Down in Lynmouth there were two choices - choice 1 was to take the easy option and climb the cliff up onto the coastal path via the cliff railway or choice 2 RUN IT - yep I took the second option (somehow I seemed to get volunteered for it - I have no idea how it happened, it just did - never back out is my motto!) so while I prepared to race the train the rest of the team sat back in the carriage. The path up the cliff zig zags and crosses over the railway from time to time and accumulates to an ascent of 862 feet. Well I was going great guns, the heart rate was flying, the legs were working hard and as I crossed over the railway twice I was in front. Now three quarters of the way up the path comes out onto a road, there are no sign posts so you have a 50:50 chance, and yes, you guessed it, I turned right taking the wrong direction and started sprinting along the road back over the railway to try and find the continuation of the path. After a minute or so I stopped and just thought this cannot be right!!! So doubled back and as I recrossed the railway the chanting from above hit me - Oh well I nearly made it. So if you ever find yourself racing the cliff railway just remember to go left and not right!!! Once reunited with the team we set off right, along the road I had just taken, and got back out onto the coastal path and headed southwards to the Valley of the Rocks. This part of the coastal path is absolutely stunning and the time just went past so quickly. The pace was set at an easy level, so admiring the scenery and jovial banter were the order of the day. Increasing the effort up the hills made up for this easy pace and the run along this section was just breath taking. Ben was, as ever the perfect guide and gave us a grand tour of the Valley of the Rocks - such a beautiful area. As to the last two days, the support crew were here and ready for us should the matter of refuelling & watering arose, however we were all good and decided to keep on going. We set off at a swift pace down towards Martinhoe, where the support crew would again be waiting for us. This section took us a little bit inland for awhile and we spent this next section running along wooded trails. Again, there was this wonderful coconut smell which I mentioned in my day 2 blog. After meeting up with the support crew for a well deserved stock up of fluids, we began the last section of the day. This was to take us out of Martinhoe and back up onto the Coastal Path and around to Hunter's Inn. I know I keep harping on about the scenery, but, Ben certainly knew how to pick the best routes for us. This last leg for me was just great, the picture on the left here was the last section of the path and then we headed down into the valley to Hunter's Inn, here I left the group and got some fast descent practice in as we headed down into the Heddon Valley. Again, Ben's organisation was spot on, as awaiting us down at Hunter's Inn was the support crew with our lunches and well deserved recovery shakes and drinks. The minibus was parked up in a meadow, there was no ice bath today, oh no, something a lot better, and colder!!!! a wonderful stream / river running through Hunter's Inn. A great way to end the 3rd day of trail running and mightily needed I can tell you. Stats for the run at the end of the blog. After soaking up the sun while eating, it was time to head back to Trail Ferret HQ for (and can I dare say these words together) some fun and core strength workout with Bay Fitness. Core work can be fun especially with this group, it was a hard 60 minute session outside to end the day of activities. After the full on day, dinner was, as ever a welcome sight and tonight was homemade chicken curry - excellent!! Enlightening, informative and a great way to end another Trail Ferret day........Tomorrow, Day 4 - Ultra day, but before that it was a trip into the kitchen to raid the fridge before lights out. After a good nights sleep, I was woken to blue skies and the sun shining through the window Day 2! 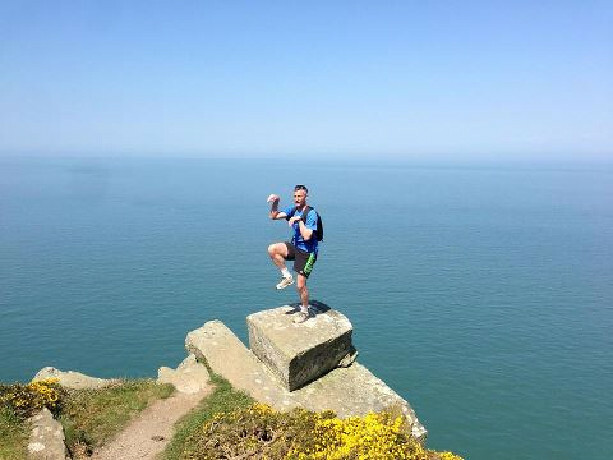 - a great way to get you in the mood for another trail run along the North Devon Coastal Path with Trail Ferret . It was up and then down to the kitchen before people stirred to have a pre breakfast cuppa and a snack. Breakfast was at 8am and Ben (Papa Ferret) went through the route with us - we were being dropped off by the crew bus at Lee Bay and then heading back along the coastal path to Woolacombe before turning back inland to St Georges House. As with day 1, the support crew and minibus would be strategically placed along the route. This was a great idea and meant that we could leave drinks etc on the minibus, thus reducing the issue of back packs, which was surprisingly freeing. After being dropped off, the first leg of the route was straight up onto the cliffs and onward to Bull Point Lighthouse where the support crew was going to be. The team were in a jovial mood, and in no time at all we were at Bull Point Lighthouse having beaten the support crew. On relaying back a message to the support crew, the team continued on to Mortehoe to where the minibus was waiting. The climbs along this stage are moderate to hard going but worth the effort as the views are stunning and breath taking. Along the route there is this wonderful smell of coconut (to be honest yesterday while running I was behind one of the girls in the team and smelled this coconut fragrance and thought she had coconut sun cream on) which comes from a yellow plant which grows in this region - gorse, furze or whin. With the coconut smell, the blue skies, sun shine and seaviews - I could have easily believed I was running on a carribean island without any hesitation. A short stop with the support crew and then we were away again round into Woolacombe and then off up onto Woolacombe Common above Woolacombe Bay where the view out across the bay was absolutely awesome. Since leaving Lee Bay, Ben's tour guide hat was on and as we ran these stages the local knowledge was shared with us, which is great for runners as we tend to just run from A to B without bothering about historical facts. The staff had lunch waiting for us, which as like yesterday was great and much appreciated, we spent a couple of hours chilling out in the grounds soaking up the sun and talking. I have listed at the bottom of this blog the stats for the run. Unlike yesterday where it was chill time all afternoon, this afternoon Ben had arranged for Andrew Blake of Bay Fitness to provide a 90 minute yoga session. Now I have never ever considered yoga so this was going to be a new experience for me and I was really looking forward to it. All I can say is, how can someone get into this position, let alone expect me to!! - well Blakey tried his best with me, but some positions just did not seem to want to happen for me! In my view ,this was a great way to spend the afternoon (outside having fun with some great people), I probably spent 80 out of the 90 minutes laughing as I tried to achieve some resemblance to the positions Blakey was trying to get me into, and the general opinion from us all was that it was a well worth session for the Trail Ferret itinerary. On a serious note, I must admit the yoga session was a real benefit and proves that stretching pays off as afterwards I felt remarkably good!!! - I just might have to start thinking about incorporating yoga into my training schedule. Early evening was taken up with another delicious home made dinner (chicken pie followed by banoffee pie) and then we spent the evening discussing effective training programming and underlying physiology within the relms of endurance running with Ben. The last memory of the day is iconic of my daily life, three of us (Harry, Ellie and myself) sitting on the bench in the kitchen indulging in a not so small bowl of cornflakes - preparation for day 3!!! !